After losing Bharat Bambawale (Brand Director of Airtel) to Samsung, looks like Bharthi Airtel is in more trouble now. India’s biggest telecom provider Bharti Airtel was fined Rs. 350 crore today for providing 3G service outside its licensed zones in seven circles namely, Uttar Pradesh East, Madhya Pradesh, Gujarat, Kolkata, Maharashtra, Kerala and Haryana. The Department of Telecom (DoT) gave notices to Airtel asking to submit a compliance report within 3 days, and forced Airtel to stop offering 3G roaming services outside its licensed zone immediately as the first priority. Department of Telecom took immediate action to stop 3G roaming arrangement between the operators for violating the rules. A DoT panel was formed to review the 3G roaming agreement, and suggested a Rs. 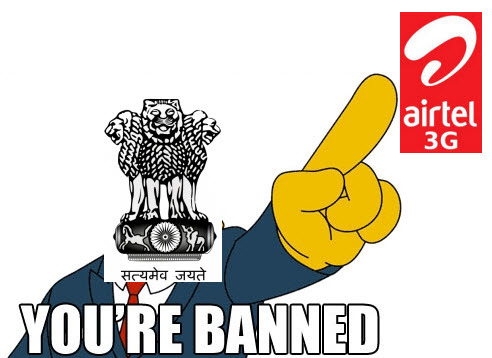 50 crore penalty on each Airtel 3G circle which violated the rules. So Airtel asked to stop 3G services in these seven circles, and has to pay Rs. 350 crore (7 circles x 50 Crore) for violating the license rules. Earlier, Bharthi Airtel, Idea and Vodafone had bagged licenses for 13, 11 and 9 circles in the 3G airwaves 2010 auctions. These three GSM operators then entered the agreement with each other to offer 3G roaming services by using each other’s airwaves. Reports say that a similar kind of notices will be issued to Vodafone and Idea for violating the 3G license rules just like Bharti Airtel. Whereas Vodafone says they didn’t receive any kind of notifications from DoT so far, and Idea is out of reach currently. Taking this issue seriously, Bharti Airtel has filed a plea with Delhi High Court to take down the order by the DoT to stop offering 3G roaming services in areas where it does not have spectrum within 72 hours. This order from DoT was issued this Friday morning (15-03-2013) after which Airtel approached the court immediately. This case hearing will come up on Monday (18-03-2013) before the 72 hour deadline set by Department of Telecom expires. Also, DoT asked Airtel to pay a penalty for violating the 3G license condition by offering the services in places where it doesn’t own a spectrum. This issue will surely cause problems for consumers as well as sully the names of Airtel, Vodafone and Idea. But the most interesting news has to come on Monday from the court in reply to the plea applied by Bharti Airtel. Let’s wait and watch the consequences these 3 companies will face in future. Please let us know your views about this issue via comments in the below section. Should Department of Telecom Penalize Airtel with Rs 350 Crore?